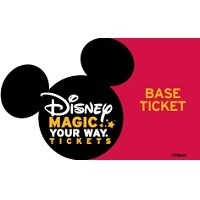 With this WALT DISNEY WORLD® Resort Magic Your Way Base Ticket, you’ll be able to visit one WALT DISNEY WORLD® theme park per-day. This means that you’ll be able to experience all of the magic that each park has to offer all in one day! The WALT DISNEY WORLD® Resort is filled with four magical theme parks and the PARK HOPPER® Ticket is the most flexible way to visit each of them. 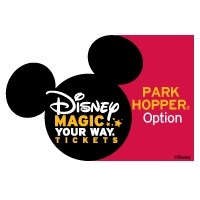 The WALT DISNEY WORLD® Resort PARK HOPPER® Ticket allows you admission to both theme parks as many times as you’d like on the same day! With four incredible theme parks and two world-class water parks to experience, WALT DISNEY WORLD® Resort is filled with more magic than ever before! The PARK HOPPER® with Water Park Fun & More ticket grants you admission to each theme park and water park as many times as you’d like on the same day. Please enter your e-mail address to get weekly specials, discounts, deals and more! You can unsubscribe at any time. HARRY POTTER characters, names and related indicia are © & ™ Warner Bros. Entertainment Inc. Harry Potter Publishing Rights © JKR. (s18) TRANSFORMERS and all related characters are trademarks of Hasbro and are used with permission. © 2019 Hasbro. All Rights Reserved. Licensed by Hasbro. THE SIMPSONS™ TM & © 2019 Twentieth Century Fox Film Corporation. All Rights Reserved. © 2019 Viacom International Inc. All Rights Reserved. The Walking Dead © 2019 AMC® Film Holdings LLC. All Rights Reserved. DreamWorks Trolls, Kung Fu Panda and Madagascar © 2019 DreamWorks Animation LLC. All Rights Reserved. © 2019 Universal Studios. All Rights Reserved.